Comics Make Me Happy! : I Am Worn Out...! What a crazy two weeks it's been. I just wrapped up two weeks of working overtime, and I'm beat. I did finish Watchmen about a week ago, I actually surprised myself by liking it, but I haven't been able to drum up enough motivation to write a reflection on it. So I'm just going to post a pretty picture. Sally's right. More heroes should wear jodphurs. Isn't that breathtaking? It's by an artist named Michael J. Peters. You can check out his website here. 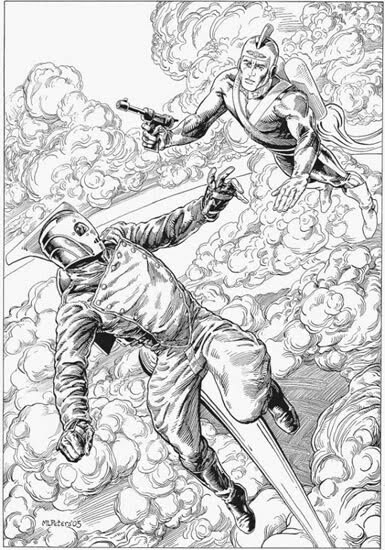 I'm not sure of the circumstances of this meeting between Adam Strange and The Rocketeer, other than the person who commissioned it said, "Draw me a picture of The Rocketeer and Adam Strange." Hopefully they're teaming up and not fighting each other. I'm a fan of jodphurs as well, but having never seen the movie or read many of the comics, the Rocketeer's appeal eludes me. You've never seen the movie? It's quite fun. It's got rocket packs, gangsters, old airplanes, and a blimp. It's all anyone could ask for in a movie, really.